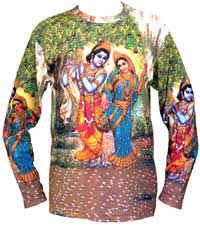 CHOR BAZAAR WORKSHOP: Hindu Art Yoga Clothing?!?! These "delightful" designs are from a company called Hindu Art Yoga Clothing and they do not fail to say "Namaste", how thoughtful. Maybe they got, namaste from the Air India flight attendant's greeting on their way to India? I came across this site while browsing for other companies like Chor Bazaar. Needless to say I was a bit shocked at the psychedelic, Goa trance inspired theme that made me feel a bit ill. For those that are not Hindu by faith, these shirts might not trigger the sickness that came over me. These are not images that should be portrayed on any individual, let alone people that think it is cool to rock one of these. In fact I don't know why anyone would wear one considering that they are tasteless and kitschy but they must be selling considering that there is a site? We had recently occupied a booth at a festival in New Jersey. We were approached on numerous occasions for the "OM" symbol or some kind of Hindu religious shirt graphic. Maybe it is just me, but I think there is something wrong with putting religion on a shirt. Here's a scenario: Imagine that one forgot to wear deodorant that day or maybe doesn't shower as frequently as they should? Would you really want to funk up your religion no matter what it is? Do you want to see people funking up the apparel that Hindu Art Yoga Clothing, produces by a bunch of Bikram Yoga devotees? Ahh...the wafting smell of perspiration and petruly oil. That's an excellent way to respect a religion. Here we have a lovely tank top, at least the sweaty arm pits will not get in the way unless the sweat dribbles downward? How about a nice tote bag that you can leave on the subway floor full of organic meat, on the same spot where an individual decided to urinate, from being high on heroin? The colors are psychedelic dood! This is a really poor take on "Desi" culture. Yoga clothing...please! It's another exploitation of South Asian culture. It's the MTV and Urban Outfitters that spawn this garbage. 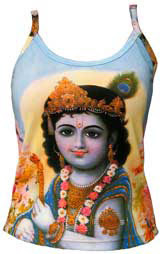 I wish there was an "about" page for Hindu Art Yoga Clothing. It would be interesting to understand their initiative and hopefully shed some light of this nonsense. this is endemic across europe and north america, and beyond. for some the world's religions provide a smorgasbord from which they can selectively choose from. "oh I'm into Shiva now, Zen is so last year." What pisses me off is they are shocked that we would be offended by the commercialization and trivialization of our religions and cultures. how do the Japanese and Chinese feel with so many getting chinese character tattoos? Or Becks having Poshes name (mis)spelled in Hindi on his arm? when will it end? The funny thing is that these guys claim that they are a religious organization and this is some how an act of God? if they claim that this is a religous pursuit then it is insulting but do they say anything about simply enjoying the beauty of the art? Why can't these shirts be appreciated for what they are: beautiful works of art. I love them and...I am Hindu! If you saw a "Gora" wearing one of these tshirts on the street, would you drop to your knees and start praying to them like a God? These images, belong in a Mandir or your Puja, not on a sweaty fool with no respect for your religion! Considering you sell T-shirts as well you sound really bitter towards a another company you know nothing about. Art and spirituality transcends and should open up minds. 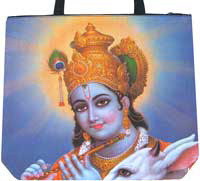 Indian Hindus wear Krishna,Shiva and Ganesh clothing and jewelery because of their love for the deities. When people post an Anonymous comment and say that we no nothing about this company it makes us think. Maybe the t-shirts are so spiritual that they transcend our understanding of the aura that they present. Was the Anonymous commenter a spiritual being that likes when people sweat on their image? You may be on to something here.